Nothing gets me more excited as a mom, health coach and foodie than families eating together on the family table. In our household, it's not always possible to achieve this, especially on weeknights, but when we do, i'm overcome by warmth, fuzziness, the occasional bout of frustration and mostly, love. Naturally, a dish that everyone enjoys, especially the tiniest members of the family, makes for a smooth and pleasurable experience. This cumin-inflected chicken curry, often on my family table growing up in India, is just that kind of dish, guaranteed to please the pickiest of palates. Animal studies have demonstrated cancer prevention effects of cumin in colon, stomach and uterine-cervical cancers. These benefits have been linked to anti-oxidant properties of cumin whereby it can literally mop up free radicals, natural byproducts of metabolism, which can damage DNA, cause mutations and lead to cancer. A spate of animal studies have demonstrated anti-diabetic effects of cumin, including improved glucose tolerance, reduction of blood glucose levels and reduced body weight. Cumin also lowered lipid levels, cholesterol, triglycerides and free fatty acids, all of which are often associated with diabetes. Cuminaldehyde, the active ingredient from cumin, has been shown to inhibit two enzymes, aldose reductase and alpha-glucosidase, both of which contribute to diabetic complications. Cumin contains phytoestrogens, estrogen-like molecules that help retain calcium in bones. How precisely this is accomplished is unclear but one mechanism is thought to entail the inhibition of programmed cell death (known as apoptosis) of bone cells or osteoclasts. In animals given a cumin extract, urinary calcium levels (a measure of excreted calcium) dropped substantially whereas bone calcium content, bone density and its mechanical strength improved. A diet rich in cumin could be a good compensatory strategy for kids who have lost an interest in milk in order to ensure optimal bone health. While high doses of spices are often required to see disease modifying effects, a close inspection of the research revealed that levels of cumin attainable through one's diet - 1-2 teaspoons a day - can have positive benefits on measures like cholesterol, lipid levels and body weight. 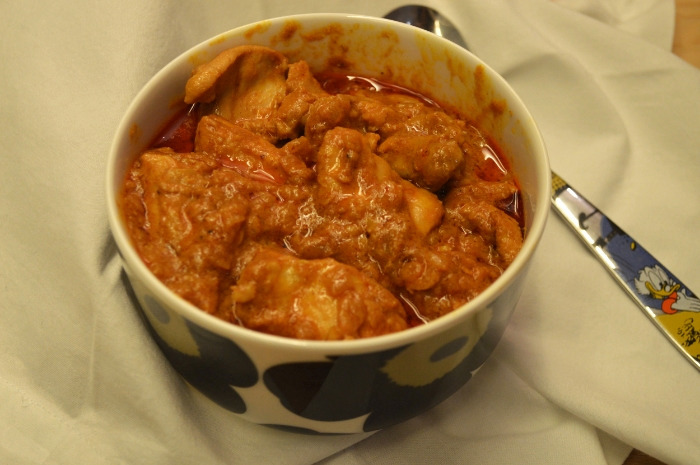 A generous sprinkling on a fried egg for breakfast, in a lentil soup for lunch and in this chicken curry for dinner could be enough to help you see health benefits, no pill required! In a pot for which you have a lid, heat the coconut oil over medium high heat until shimmering. Add the onion and sauté every minutes or so for 10-15 minutes. You want the onion to be golden brown and caramelised but not burnt. Add the ginger and garlic and sauté until fragrant, about a minute. 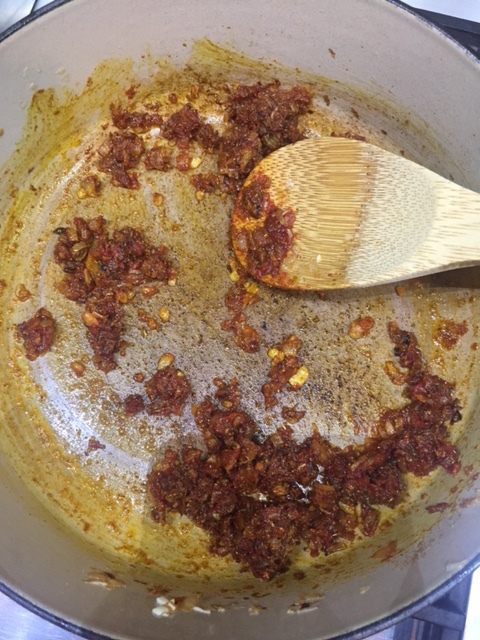 Add the tomato paste, turmeric, cumin and coriander powders and mix well into a dry paste. Add the yoghurt, chicken, salt and pepper to taste. Sauté for 5 minutes until the meat is sealed and no longer pink on the outside. Add 1/4 cup water, cover and bring to a boil. Lower heat to a simmer and cook with the lid on for 10 minutes. Remove the lid and cook for another 5 minutes stirring occasionally. Check the seasoning, adding more salt if necessary. Serve garnished with cilantro if using together with rice, quinoa or bread and a side of veg for the perfect, balanced, delicious supper.